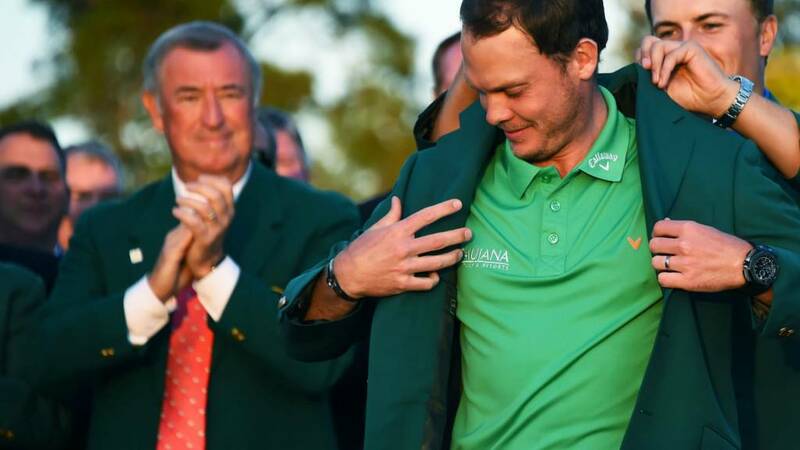 The moment Danny Willett received his Green Jacket. But spare a thought for Jordan Spieth. So, he has the Green Jacket, his has his first major, he has gone from golfer to household name. Smashing evening's entertainment. Get to bed, you've got work in the morning. Danny Willett: "It has been crazy. I can’t really describe the emotions and feelings, someone has got to win and fortunately it was me. "It was tough. Jordan kept pulling ahead and I had to dig in and dig in. I thought we needed to get to six or seven. It was a surreal day with ebbs and flows. I was fortunate that the shots we hit were correct and I holed putts when I needed to. "My wife was born in 10 minutes time 28 years ago, my son was due today and born early to let me come and play. Talk about fate, it has just been a crazy week." The moment you present the jacket you won last year and should have won again. Ouch. "Everybody's going to recognise Danny Willett now, and the dollars are going to start coming in. Golf can rip one man's heart out and give another man great joy." Jordan Spieth on BBC Two after a final round 73: "It's really tough. That ball flight is one that's come up quite a bit for me, and I just put a bad swing on it. It was just a lack of discipline to hit it over that bunker coming off two bogeys. I went away from the gameplan I was using on the front nine and got a little conservative. It was a very tough 30 minutes that hopefully I never experience again." "With Willett as a major champion, the UK golf scene has two players at the very top in McIlroy and Willett. McIlroy has competition." It's the Butler Cabin and Jordan Spieth looks suitably lost as Danny Willett walks in. Masters runner-up Jordan Spieth reacts to dropping six shots in three holes and losing the tournament lead: "It’s tough, it’s really tough." On finding the water on 12: "That ball flight has come up a bit on par threes for me this week. I put a bad swing on it at the wrong time. It was just a lack of discipline coming off the two bogeys instead of realising I was still leading the Masters by a couple of shots. "After four birdies in a row to end the front nine I knew that even par was good from there and sometimes that makes it hard. You put some bad shots in and all of a sudden I’m not leading anymore. "We still have the confidence that we are a closing team. I have no doubt about that ability I just think it was a very tough 30 minutes that hopefully I don’t experience again." "This is just what British golf needed." "Jordan Spieth will lose a lot of sleep over this. It was stay with him whole life. It was almost Norman-esque." And this is how the winning round looked for Danny Willett - bogey free and Masters victorious! Danny Willett shot 67, the same score as Nick Faldo in 1996 when Greg Norman famously threw away the lead. "That is something Spieth will have to reflect on. It will leave a mark. It will take him time to get over it."